Rural America – We Got This! I grew up in rural America. A small place — that I can’t even really call a town — on the summit of the Appalachian Mountain Range in central Pennsylvania. Population, 264. My Elementary school was connected to the Jr./Sr. High School. The school bused students in from over twenty miles away and still my graduation class size was just over 100. I lived in one of the most populated areas; which means someone was within shouting distance. It was within walking distance of the school. 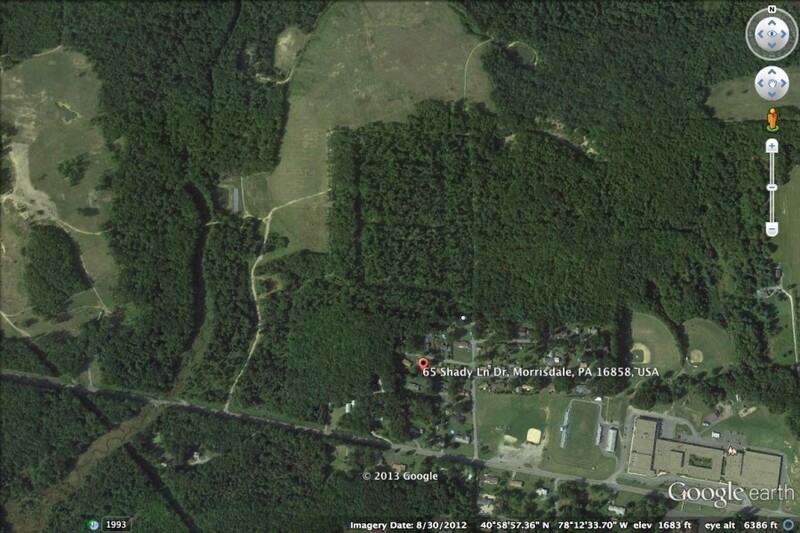 If you look at the photo below you will see my school, the sports fields I played on, the woods I hunted, and the streams I fished. It was remote, to say the least. Just look at the distance between the “development” we lived in and the next closest home! The areas that are clear-cut were strip-mined back in the early-1900’s. Mine shafts run all through the area (in fact, there’s one under my parent’s house). We didn’t have a mall. There were no 7-Elevens. We didn’t have cable television; just three over-the-air channels (if you count PBS) that were not entirely clear. What we did have was wildlife, to include an occasional bear wandering into the back yard. We played pick-up football games in the autumn on fields that were, essentially, pastures. My summers found me with my fishing rod tied to my bike frame, a baseball glove on the handle bars, and something that was once a baseball (but now was held together by electrical tape) tucked inside. Winter was brutal on the mountain, but it didn’t stop us from zipping ourselves up in “snowmobile suits” and grabbing our Red Flyer sleds and toboggans. We skated on frozen ponds… the same ones we swam in (against our mother’s wishes… and knowledge) during the summer. Catching tadpoles was practically a rite of passage. The schools closed on the first day of buck season. The county waited all year for the Fair to come in August. It’s how we lived… and we loved it. The people were genuine. Hard working, self-sufficient, folk who would give the (flannel)shirt off their back. We looked after our own, yes… but we also looked after anyone else who found their way into our town. We stopped when someone’s car was broken down alongside the road. We supported the local high school football team on Friday nights. A night out was sitting with friends, drinking “pop” and dreaming. You know, simple acts of kindness and living. I expected the whole world was like this until I went off to college. Shocker! This was not at all unlike many areas of West Virginia. This is probably why I love that state. It is so much like where I was raised. It’s certainly why I hate when people think of those who live this way as backwoods country-bumpkins. We’re not stupid! You can see why those who think this way offend me. They offend the people of rural West Virginia no less. I convinced myself a while ago that they lack emotional intelligence. By this time, is there anyone who would still disagree? A Twitter post from a Vantrease family member. It all started weeks after Austin Vantrease, the pride of the family, was put behind bars in 2010. The sister, Andraya (Andy) Vantrease, puts out what I call a “cutesy” post on social media that really just offended people of West Virginia. It was based on the premise of “oh, the people you meet” and, in a round-about way, poked fun at those in rural America. It has become her trademark passive-aggressive tactic. Some people are such idiots! Why in the hell would a person irritate those who it would be best to leave alone? Congratulations. Way to annoy the wrong people. I can hardly wait for the insults to start rolling in about the citizens of St. Mary’s, WV. I take that back, in effect, they already have. You would think that after the Parole Board, in no uncertain terms, cautioned this family to think twice about what they post on social media that they would not do something this foolish… so flippin’ soon. I swear, some people just never learn! This is after all the “misinformation” that was released by Andraya Vantrease leading up to the hearing. Eh, let’s call it what it is, by my way of thinking… libel. This family has said plenty for me to file a suit against them. I believe I would win. I’ve even been asked if I want to pursue this. Maybe, but I’m so sick of lawsuits, lawyers, judges, and criminals. Then again, it’s always nice to have this (and the ever evolving lies) in my back pocket in case they go after this website (or me). Andraya Vantrease would be the first name on my claim! She’s in deep. If Austin Vantrease has any chance in the future I’d suggest he separate himself from this “support system” now. He won’t, of course, and this is why he seems doomed to me. Would you actually believe that one of the other men involved in the attack actually attended his last parole hearing in support of his release? He proudly represented himself as “best friend of Austin Vantrease”. It’s true! Nothing like signaling to the Parole Board that nothing has changed in his post-release social life. Like I told the Board, his family and friends are not his support… they are part of his problem. Good Lord! What is the matter with these people! Their level of intelligence (IQ) is not their fault, but for crying out loud, folks with far less than they have far more common sense. What can be said? Just what you said! i loved your growing-up story. It is similar to my own in my beloved Western NC mountains. I also love West Virginia, the state that reminds me of my own. We visit at least twice a year, and it won’t be long until we make our apple butter rum. It is made outdoors by the old folks (like me), and I dread the day that apple butter makin’ will come to an end. It seems that the younguns are not interested in the carrying on this tradion and would just buy it at the store. Yuk!! Jo, I edited you (above) comment to correct the spelling. Kenneth, you bad boy! You changed my “apple butter run” to “apple butter rum!” But, hey, Apple Butter Rum sounds good to me! I love you! Good job, too, Professor! 🙂 Love to Sue, Ryan and Kari, too. Thankfully that’s the difference between you and them. Wondering how Ryan is doing these days. I grew up in Potomac, MD a typical DC Suburb. My husband introduced me to his home in the Western PA mountains near Somerset. We have a weekend home now north of Cumberland, in Myersdale, PA. The people who I’ve met and those who are our neighbors are the salt of the earth. Generous beyond belief, kind and wise. It’s a simpler life there. Everything moves a bit slower. The seasons are marked by the trout running or buck season, etc. They may not have attended an Ivy league, but they are as wise as the mountains that cradle them. They’ve taught me so much. People who put them down are just ignorant. Building yourself up at the expense of others shows the lack of confidence and worth you have in yourself. Ken, I had no idea that you grew up smack dab in the middle of PA. I always feel like anyone from the middle part of PA and west is considered West Virginia. They are all made of the same stock. My personal experience has been that people who grew up like you did are really good people at heart. They would do anything for others. They give food, they give clothing, they give money, they come and help when it’s needed. They may not speak perfect English, sorry American, but they usually have good hearts and have worked hard for what they have. I was just telling my husband the other night that my mom’s parents never carried a note on anything. They paid cash for their houses, they paid cash for cars, they paid cash for everything. When my grandmother was having the heart attack that eventually killed her she had to get under her bed to get her shoebox of money out to pay for the doctor. They didn’t have much but what they did have was completely paid for and was theirs and the entire underbelly of their home was filled with food. Food from the steer they raised in the summer, fruits and veggies they grew in their garden and other things they traded for. They wanted for nothing and were self sustaining. What I have discovered with “city” people is that they will run you down to get one car ahead of you in traffic, they flip you off, they refuse to help even those that need help the most because they don’t want to get involved and they owe, they owe so off to work they go. Never taking the time to see the world around them. I am surprised that you, Ken, can stand to live in Ashburn, it’s just too many rats in the race for me. I need those trees, the fishing rod and an old fashioned bike. I would love that apple butter rum recipe and I am saddened that I didn’t get to put my garden out this summer so I could eat fresh food that I grew. For your own sanity you have to keep notes of things those people do but you have to let it leave your mind just as fast. You have a much bigger task at hand, your kids, your wife, you, the dog, and breathing. Of course saying prayers for you always! Ken, this is a great piece – the way you paint your childhood makes me feel like I was there! Such carefree, beautiful times. While I hail from the Eastern part of the state (Lancaster), I only lived there for the first 8 months of my life. I still have family there, but I have also have family in Wexford, PA (about 2 1/2 hrs from there?). Such a pretty part of the country…just love PA! Thinking of you all – and SHSP. She is digging her brothers grave. Let her continue. I work at Huttonsville as a nurse. Those boys in the south are not ones to mess with. Hi Ken, I really enjoyed your post today – you did a beautiful job describing your childhood and what it’s like to grow up in a small town. I’ve been thinking about it, and I’ve decided that how a person chooses to live his/her life is an individual thing. I grew up hearing my Mother day, “he/she is a product of their environment.” I understood it to mean the kind of home/family life the person was raised in. I’ve seen some kids defy the values their parents endeavored to teach them and totally rebel – but then I’ve watched as many of those kids came to understand the worth of those values. Some kids are given a message that the world revolves around them and they can do whatever they wish without regard for others. Some kids are instructed to “do unto others as you would have them do into you” – the proverbial golden rule. Some kids are raised with mixed messages, I.e. “Do what I say but not what I do.” Kids obviously have a hard time with those messages because it seems hypocritical and false to them. Overall I think the old cliche rings true that children live what they learn, and this would apply independent of whether they were a city mouse or country mouse. Unfortunately if a child is not taught to regard other people as being worthy of respect and consideration, they may never develop the ability to show genuine empathy and compassion. They may view other people as being less than themselves and undeserving of kindness. At worst, they may begin to objectify people as though they have no feelings at all. Individuals who de-evolve to this level are sometimes referred to as narcissists , sociopaths or heartless jerks — and you can find them most anywhere you go – they’re easy to spot because they’re shallow, arrogant and believe themselves to be above the basic rules of common decency. This description seems to fit a certain young man who felt it was perfectly okay to violently attack another young man and leave him to die — and then brag about it later. If his own parents are unable or unwilling to acknowledge his culpability, how will he? Positive change only happens in tandem with the truth – and if one cannot or will not acknowledge the truth, there is no change…no matter what part of the country or world you hail from. Ken I read your post yesterday but couldn’t answer until today. Andy, Andy, Andy….you are the gift that keeps on giving! 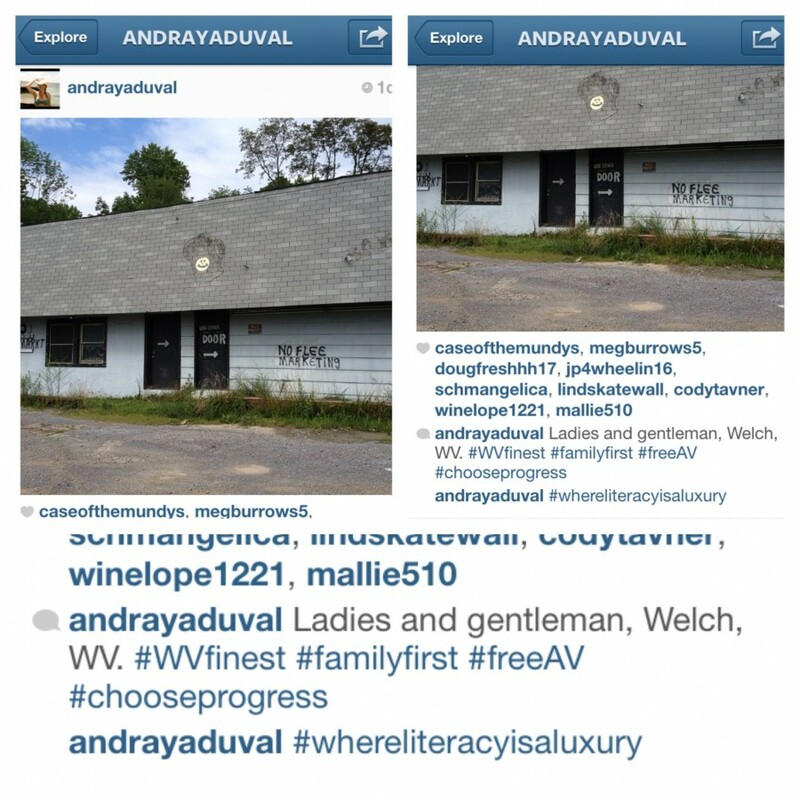 As you call them “WV finest” and “whereliteracyisaluxury” will no doubt hear about this “tweet” of yours in the prison that your felon brother Austin is living in these days. I believe your mom said when Austin kicked Ryan “boys will be boys”. Can’t wait to hear what mom says after WV finest show Austin how “boys will be boys”, there just romping around, let’em play! As far as the people of West Virginia…I have four cousins who grew up in WV just over the Maryland line. Two brothers and two sisters. All attended colleges, one brother (WVU) runs a business that does artificial insemination on cattle, one brother (Duke U) is a chemical engineer working for a pharmaceutical company in Switzerland. One sister (Duquesne) is the DON in a UPMC branch hospital in Palermo, Italy that specializes in multi-organ transplants, and the other sister (WVU) majored in Agronomy and Environmental Sciences has taught all over the world and currently teaches in Thailand. None of them have been in fights, none arrested, non have kicked others in the head. Their parents continue to run their business and live on their farm in WV. Let me compare them to the Vantrease children of Delaware. Let’s see Andy graduated, loves Cork and Bottle in Dewey, writes and and tweets nasty things about others, Austin is a FELON and will always be a felon and currently lives in a PRISON, and the other brother has a history of getting arrested for fighting in Dewey Beach in the summers, haven’t heard much from him. Could he be ashamed and embarrassed of what Austin did to the family name? Seems Andy is so proud of Austin, she would be, didn’t she say once it was she who raised him while her parent were out and about? Quite a contrast of characters, you think kids were switched at birth? Pretty impossible given the geographical differences. Do you think it was maybe the environment? Almost heaven, West Virginia, Blue Ridge Mountain, Shenandoah River …….The parents? Who knows? Maybe Andy will enlighten us with her tweets! Anyway Ken, enjoy this beautiful weekend and keep the tweets coming! ANNA! Love it! I got in trouble when I said WV’s finest would make AV his “biatch.” I am so impressed by your cousin’s, especially the multiple transplant doc. My dad was the state president for FFA, WVU, back in the day but when it came to cows giving birth he hit the floor. Instead he studied economics, went into the Air Force, worked for President Reagan, President Bush-the first one, orchestrated the first Gulf War that hit from the air and didn’t cause 1 civilian casualty and now he runs a successful real estate business. I do have a cousin that grew up in West Virginia, Preston County one of the poorer counties, and he became basically a sharp shooter for the military. He spent a year in Iraq doing nothing but practice and training. End of his year he shot one bullet, some big shot was killed at the same time, it made the news and he was home. He did a service to the US to not allow any more 9/11’s. The best spinal surgeon I have ever come into contact with studied at WVU and his family was from there. He saved my father in law’s life by acting quick: at 9PM he watched the MRI on my FIL and was in surgery by 10:30PM, out at 4AM but he did all the right things like a drip of steroids down his spine, securing everything in his neck to relieve the pressure off his spinal cord and now the nerves have started to reroute themselves and he is just about walking, most of the feeling is back and he is on his way to a pretty good recovery. He then helped my mother in law to get relief from her back pain and fixed her spine. He is retired now but he was amazing and he was raised in WV and went to WVU. Love it Anna, kept it going! Rhonda, my cousin is a nurse at the multi-transplant hospital, she is the Director of Nurses. LOL! I hope you are joking John Maletta because my sides are aching! FUNNY! The technical term is “redneck”. And Ken you found a still on craigslist? Do share please. And if you find that apple butter rum recipe let me know. I know what this post has been about but sometimes you really have to find some humor in the corners or you will go nuts. I am watching Keeping Up with the Karashians at the moment, why? – it’s on. 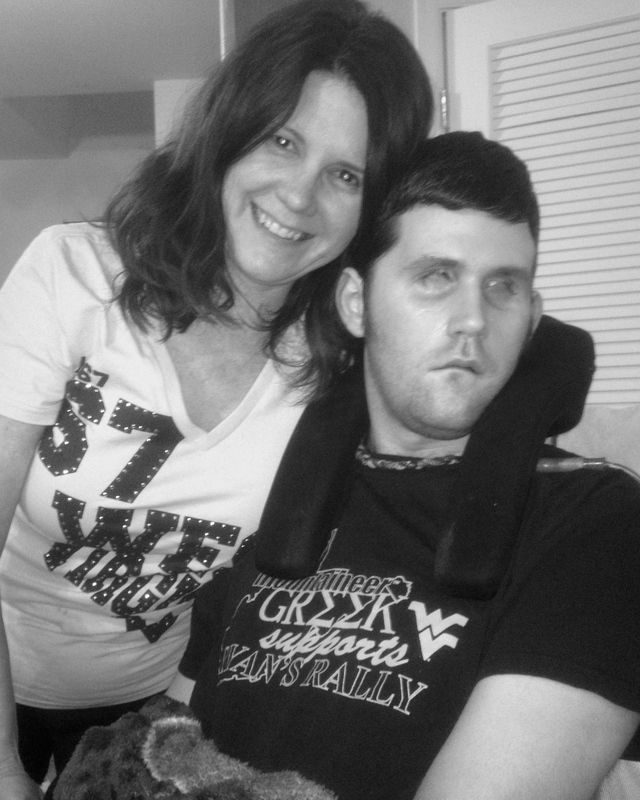 I think Ryan’s life should be a “reality” TV show, it isn’t fake, it’s real, it’s heart breaking but it’s also amazing, caring, loving, graceful, incredible, heart warming and maybe it would make our world a little less about self self self and more about helping others and love and family and caring. Ken give me the word and I will put out some feelers for a local DC firm that does a ton of filming and has some good connections as well as an NBC connection-that one is a bit harder. Talk it out with the family, talk with Ryan and email me. Again John Maletta, thank you for the chuckle. I love the country in which I grew and this post reminds me of when I used to ride my bike down that old dirt hill.. first time without my training wheels. and the first time I kissed her I lost my legs. bring that beat back to me again. Oh those Vantreases. I really hope that Austin’s “roomies” get wind of how he and his family feel about his “host” state. This is exactly why all three of the Vantrease spawn are like they are. They are a product of their environment and the way they were raised. Sadly, all of us “illiterate”, backward, hillbillies here in WV probably have more manners, social skills, values, compassion and decency than they could ever comprehend or begin to possess. I grew up here, as my entire family did. My mother was raised on a farm, but went to college, as did her sister, myself and both of my sons who are students at WVU now. Both of whom, are very community service oriented, Eagle Scouts and get this….can even spell. And, I might add, would never, ever, ever, behave in a manner such as Austin Vantrease or his arrogant and pretentious family.